Mat Irvine: This is the first time the ungainly LLRV has been modelled, and Three Stooges Productions (explanation later!) has produced a multi-material kit, from photo-etch brass, injection resin and styrene parts. The kit looks daunting at first, but it actually goes together fairly easily, though the plans need clarifying at some points. The photo-etch brass components cut easily from their sheet - a sharp knife blade in a heavy-duty cutter will suffice. The tags - they can be sharp - need cleaning up with a model file. Being soft brass, these parts bend easily - sometimes too easily - and care is required to get the angles correct. They can be soldered, but great care is required for this, as the components are small and thin, and can warp very easily. Hence superglue is probably the most straightforward option. Closeup (below) of the photo-etch sheet and resin components. The four squares and legs are made of styrene plastic. The resin parts need cutting from the runner, and again will need a modicum of cleaning up. It isn’t precisely clear how you deal with the four tanks, but they need the section where they are attached to the runner left on, and this shaped into a triangular form. Then a drilled hole in the end will allow them to match up with the four extended pins on the engine mount. Part one on the photo-etch sheet isn’t mentioned in the plans, and I had to contact Tom Grossman (one of the Three Stooges) for clarification. 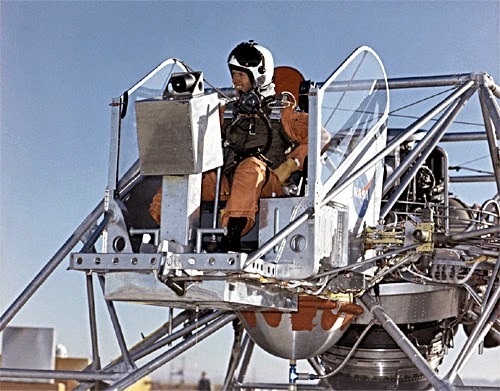 It is actually an optional cockpit structure that in the real thing was retro-fitted to provide a more restricted view for the pilot, as it would be when it came time to fly the Lunar Module. Below, various structures formed from brass, matched up to the relevant instruction sheet pictures. Overall finish is aluminium, with the centrally-mounted engine in darker metallic shades. 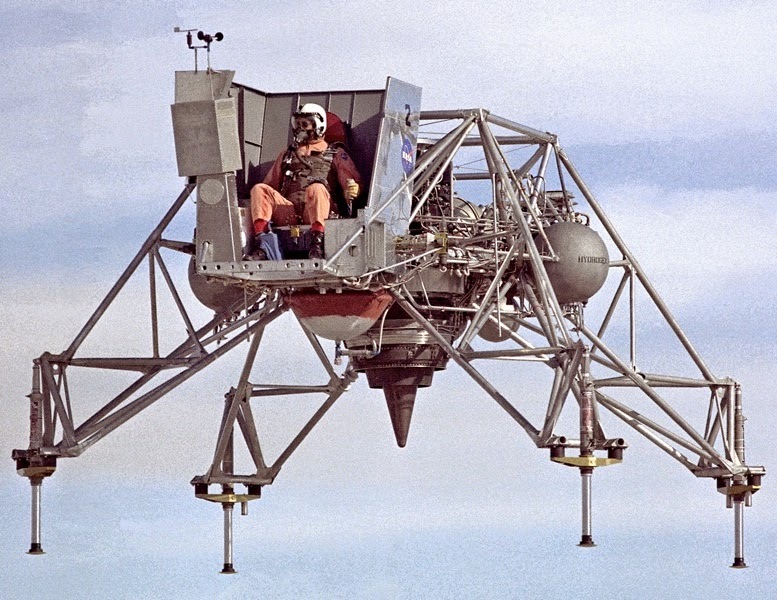 The ejection seat has dark red cushioning fitted to a steel frame, and the pilot’s suit can be dark blue or orange. There are no markings supplied, but the cockpit area (such as it is) does have small NASA 'meatball' logos on the side panels. The ones here were taken from a sheet made some years ago by RealSpace Models. The completed photo-etch section (below) looks impressively complex. 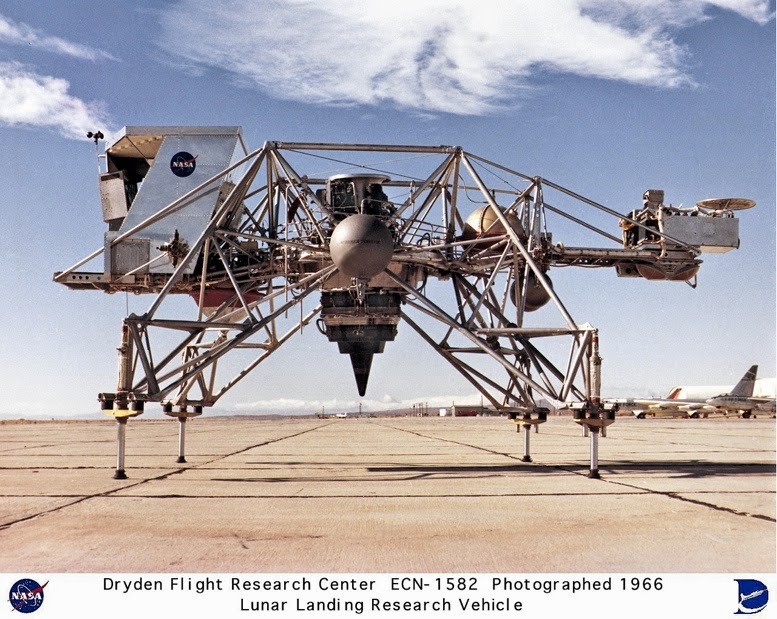 The two LLRVs were later joined by three similar LLTVs (Lunar Landing Test Vehicle). 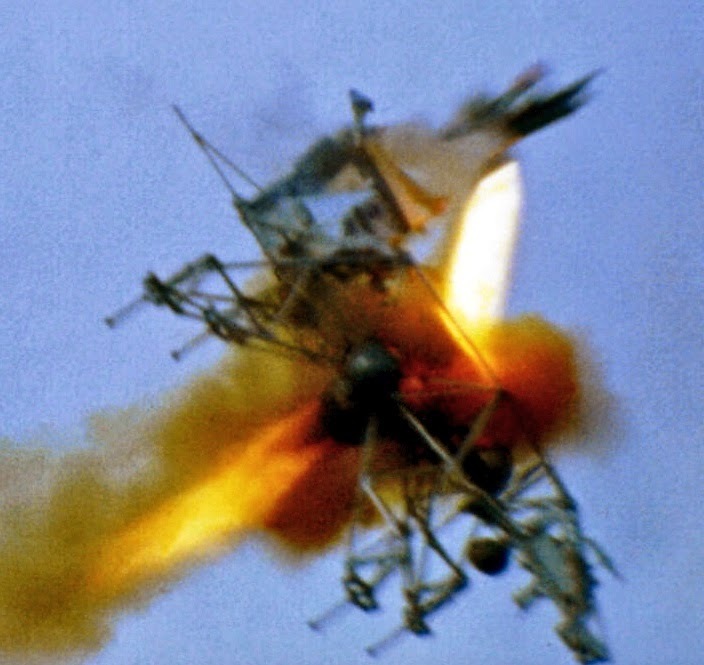 They were not the easiest of craft to fly and three crashed, one in a most spectacular manner (below) though the pilot ejected safely. Parts: 10 photo-etch brass, 19 resin and plastic. Thanks to Three Stooges Productions for the kit. The other two in the team are Rob Schmitt and Chuck Holte. And yes, they (sort of) resemble the members of the famed American vaudeville and comedy act! Visit Three Stooges Productions at Tag Team Hobbies here. More pictures (below) starting with fitting the resin components in place, again matched up to photos in the plans. Below, two pix show the completed basic structure. Alternative cockpit part (above) shown against the finished model, and in place (below) in the uncompleted model. The finished thing (above and next two shots). 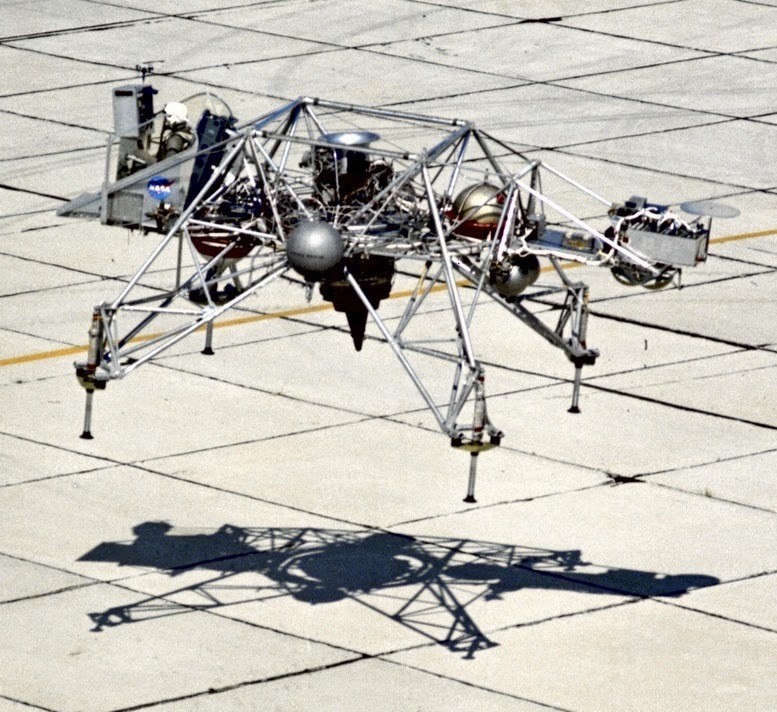 Note the tiny NASA meatballs, just visible on either side of the cockpit structure. LLRV (above) with 1:72 scale Hasegawa figure, and (below) same-scale Airfix Jeep and weathered-down diorama base added for presentation. 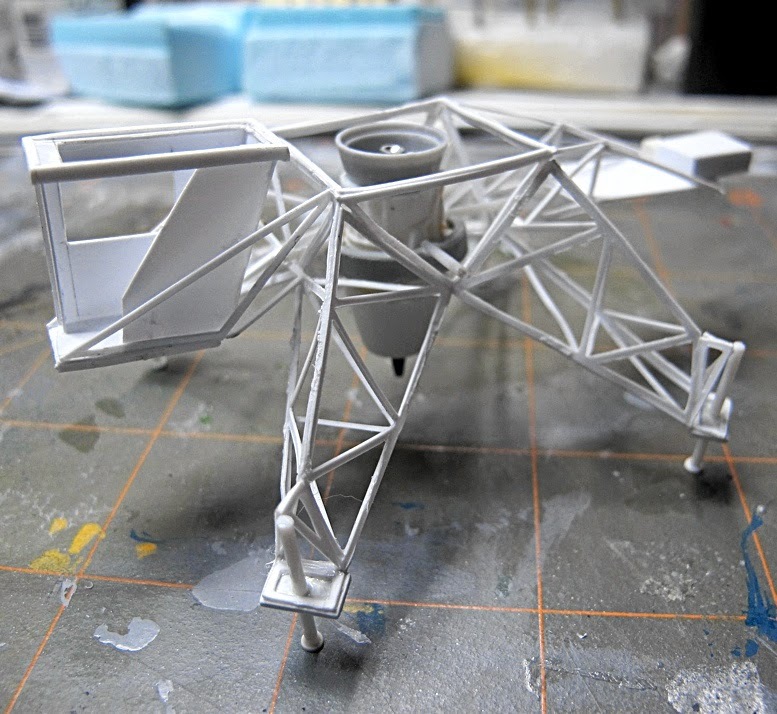 Builtup LLRV (above) with 1:72 scale Airfix Lunar Module, and (below) a Three Stooges prototype model made in styrene, before conversion to photo-etch brass. 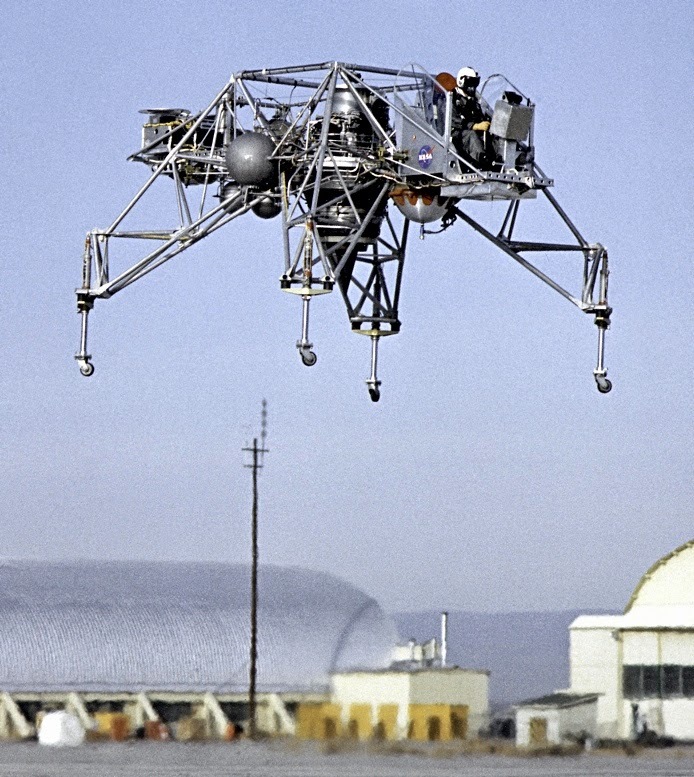 Useful reference material (below) provided by these NASA shots of the real thing in use.